That seems simple enough. Thanks. One more question. I'm also deleting emissions. Of the 4 seleniods that were in the rats nest, what do I need to keep? Isn't one for fuel and one I need to use for boost or something? I remember reading it somewhere but I can't remember now or find where it was. According to rotary resurrection I don't need the turbo boost solenoid if I'm running a straight exaust, which I'm gonna be running open downpipe for now until I can afford exaust. And from what I read I don't need the fuel pressure solenoid either so I don't need any of the solenoids from the rats nest. Yes? Hmmm I've been doing some reading... If i run a open exaust I'm going to get boost creep. Does this mean I have to get a fuel cut defender? Is there anything else I need. I know I want to get a wideband to make sure I don't lean out. Am I going to need a boost controller? This is a good diagram for emissions removal. You don't need any of the solenoids. If you remove the rat's nest, you'll have to route new fuel lines because you'll be removing some of the metal fuel line along with the nest. So with this diagram, it's Lunchbox Critter's JDM engine w/ rat's nest removal. The yellow stuff, his didn't come with, so ignore the fact that it's yellow. Remove the ACV, the rat's nest, the AWS, and all the stuff in grey. The blue is new vacuum lines. You still need the pulsation damper, don't remove it. The cold start system can go in the trash. Yeah, you can ditch the boost solenoid, but you'll need a manual boost controller. With an open exhaust you'll have boost creep pretty bad. Even with the upgraded S5 wastegate design, you'll still experience it. The only way to stop it is by porting the wastegate and restricting the exhaust a little. Yeah, with a restrictive exhaust you'll lose some power, but you won't lean your engine out and kill it. Better to be safe than sorry. You can make an exhaust restrictor plate. Trace the downpipe flange on some paper, cut the outline of the flange on some sheet steel, then swiss cheese the middle. It allows enough flow, but restricts it just enough to prevent boost creep. AGeen you are seriously a life saver. Or atleast a motor saver. 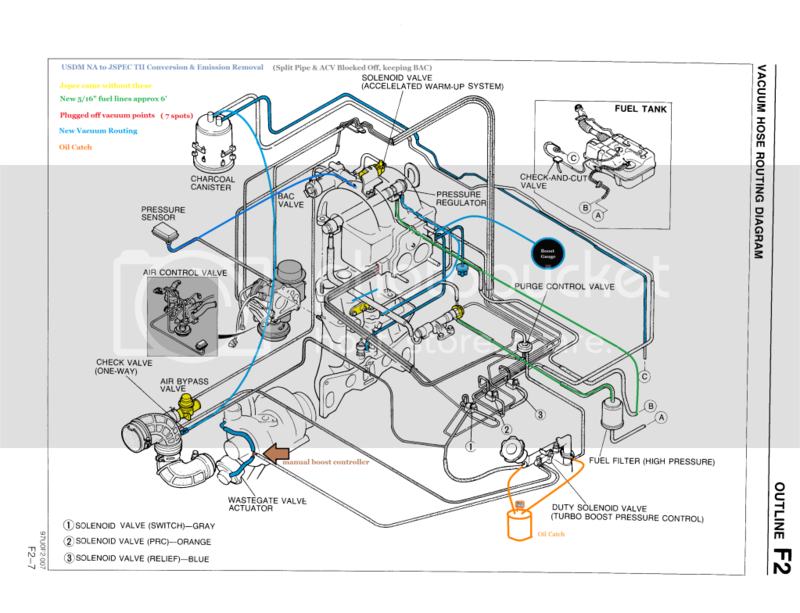 I'm mostly done with the emissions removal but that diagram deffinatly helps with some of the vacume lines and **** I wasn't sure about though thanks. So even if I restrict the exhaust I still need to port the wastegate? I'm thinking I'm going to cut up my old exaust and use the muffler and some of the pipe off it to restrict the exhaust some. Just have to make a flange to bolt it to the downpipe. 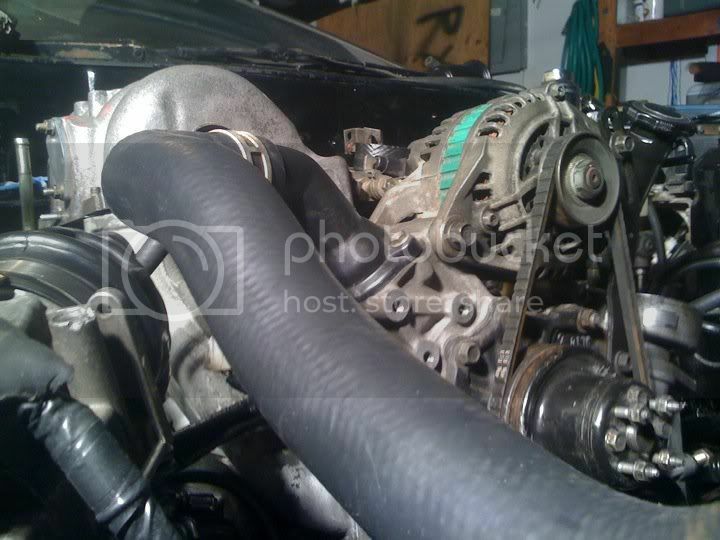 I talked to my buddy and came to the conclusion my best bet would be a wideband and safc.... Unfortunatly I can't afford that So I'm going to port the wastegate, get one of those cheap $10 manual boost controllers off of ebay, and cut up my old exhaust to restrict it a little. Any advice on those ebay manual boost gauges? Any car part that cheap seems like it would be crap but I guess there's not really much to it. There are mixed reviews about the Ebay MBC. I wouldn't buy one personally. You can find writeups if you do a google search about how to make your own. That way, at least you know what's going into making it. A wideband is a great investment. I think everyone who owns a modified turbocharged car should have one. SAFC.... I learned my lesson with it. It's really limited to what you can and can't do, and you're better off just saving your money and getting an Rtek ecu or some sort of standalone. My Megasquirt ECU cost me around $400, but I had to build it myself. There are tons of writeups on how to build them specifically for the FC. Just make sure you follow only one set of instructions. What kind of downpipe do you have? If it's the stock one, then one of the flanges on the stock exhaust should work I believe. Otherwise, Mazdatrix sells flanges. By the way, the boost controller is designed to RAISE your boost. It can't really limit it more than the spring. The reason you'll need one is that once you restrict the exhaust, the stock spring is (like you said) only 5 psi. The MBC will raise the pressure up to stock level (I forget what S5 is now). It's all about safety. I don't know what kind of downpipe I have. I bought it off some did who bought a whole turbo exhaust off ebay for $600. He had an n/a though so didn't need the downpipe. It looks nice though. Has the spot for the 02 sensor and everything. The mazdatrix flange looks like it would work though. Is the stock 3"? And my old exhaust isn't stock. It's some hack job the previous owner put on. It's all just welded together. I've heard about the megasquirt, I'll have to check it out. Was $400 new? That's cheap as **** for an ecu isn't it? I'll have to lookup what you mean about building it. I would rather do it that way anyway. I like doing **** myself rather then just buying it ready to go. If I get a wideband for now, it's just going to tell me if I'm leaning our right? So I know to take it easy. I don't understand how you need a wideband to see it and a safc to ajust it. It seems like one thing should be able to do both. I guess I would have to see them set up to understand. You got a thread or anything on your build? I'd love to see it. I wideband is like a speedo, it can tell you how fast you're going but you still have to press the pedals to do anything about it. A wideband monitors your air/fuel ratio which is influenced by a number of factors, but for simplicity sake we'll just say it measures how much fuel the engine is getting. The stock computer does just fine at stock boost levels (you are using a turbo ecu right?) but above that you have to "add fuel" to keep your A/F from getting too high (leaning out). To do that you either have to use a piggy back type system (SAFC) that tricks the ecu by telling it incorrect values to get the desire result; an in between (Rtek) which is built off the factory ecu and allows you to change the values that it uses to calculate fuel deliever; or a full stand alone (megasquirt, haltech, etc) that completely replaces the ecu altogether and gives you full control over every aspect of running your engine. Regardless; a wideband is the first step (if you're wise) but it can't do the job by itself. The Rtek and stand alone ecu's can log wideband output to help you tune, which makes it seem like you are viewing A/F and tuning w/ the same device, however in reality, it is simply displaying the wideband value to make tuning easier. 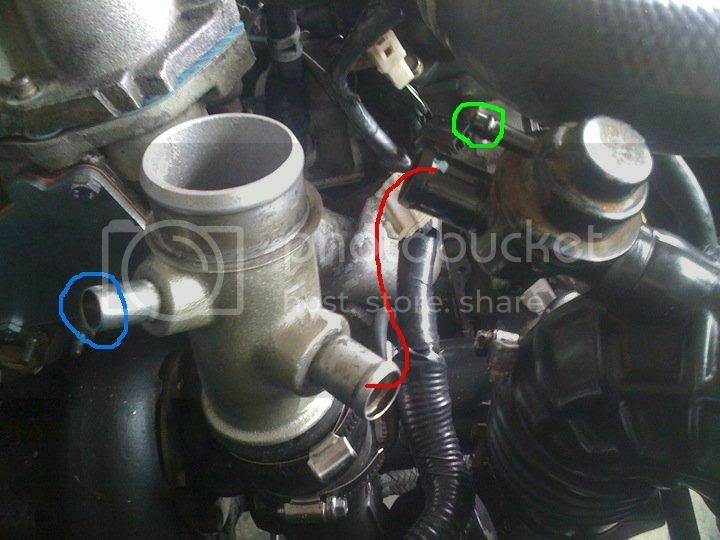 As for that boost controller, as AGreen stated it can only raise boost, not lower it, so in your situation it has the potential to do far more harm than good, Especially since you have an S5 turbo (assuming, since its an S5 motor...) If it were an S4 there MIGHT be a reason to add a boost controller, since twin scroll was eliminated, but that is a non-factor for you. I would forget about it until you get the ecu situation straightened out and get some higher capacity injectors. Even w/ a ported wastegate, and a spring on the wastegate arm boost wants to creep on my stock S5 turbo when the weather gets cool. Now With 10th AE Fun! Scrap the SAFC idea, there are plenty of better ways to control fuel, like the Rtek 2.1 ECU(digitaltuning.com). The wideband is a monitor of what the air/fuel ratio is, you need an ECU capable of adjusting the fuel curve to change the air/fuel ratio. Also if you have the S5 manifold/turbo then porting isn't as necessary because the wastegate is a better design than the S4. It will still creep a little especially if you have a free flowing intake as well, but with an FCD or higher flowing secondary injectors you will be fine. Wow thanks for all the info guys. So what do you think my best/ cheapest bet would be for now just to get the car road worthy? If I can find some mufflers and maybe a cat to add to the exhaust would that solve my problem until I have the money for rtek and a wideband? And yes Sharingan, I have a s4 turbo ecu. They guy I bought it from said it was chipped. Would that mean it possibly has a rtek or something like it? I pulled the top to try to look but I don't know what I'm looking at. I didn't see anything that looked aftermarket. How can I tell if it's chipped? And if it does have a rtek, or when I'm ready to buy one, all I would need is bigger secondary injectors and a FCD? For now, just put an exhaust on it, with a stock downpipe it won't matter what kind of cat back you have it won't creep. Hell, I didn't creep running open stock downpipe. Don't bother with an FCD, its a waste of time and money that you could put towards an Rtek or other standalone, which would delete the fuel cut feature altogether. That being said, plenty of people run FCD's and crank up the fuel pressure and/or run larger secondaries and do just fine. Far from optimal but its usually safe. Do i have to have the stock downpipe? I just spent $80 on the aftermarket one... I got a couple mufflers and can probably find a cat somewhere so should that be good? I'll just keep an eye on the boost. well if you have an aftermarket dp then thats fine, throwing a cat in the mix can only help. Might wanna pull the turbo and port the wastegate to the limit of the stock flapper just so you won't have to pull it once the car is running. I heard of the plate having numerous holes, but this works just as well. This way, you can use the downpipe you bought. Just get some 3" pipe and one of the 3" flanges from Mazdatrix, weld up some exhaust piping back to a muffler and you'll be golden. 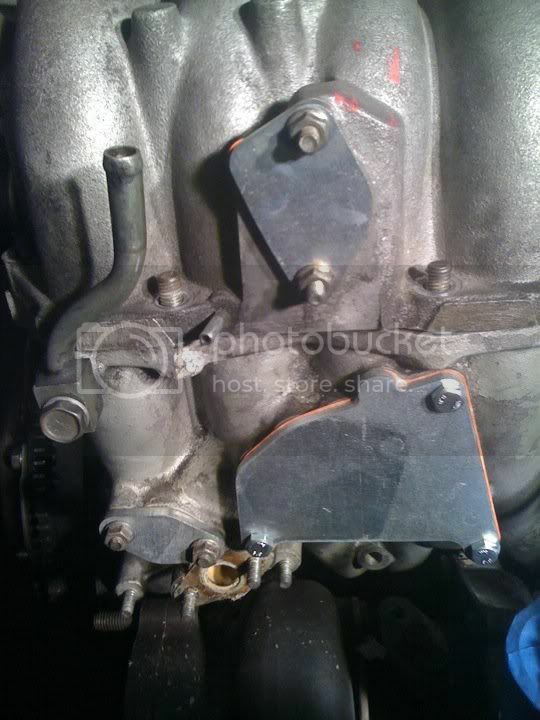 Slap the restrictor in between the flanges and your boost creep is gone. I was planning on pulling the turbo on saturday to port the wastegate but then 1sweet7 and a couple other people said that since the s5 wastegate design is better, porting isn't really as necessary. So should I still do it? AGreen if i go that route your saying I should go downpipe->restrictor pipe->3' pipe->muffler? And if I do that am I still going to need to port the wastegate? Got some parts in the mail... Mazda oem rad hoses, fuel filter, and a bunch of intake gaskets. Also got the Bonzai block off plate kit and omp elimination kit, and a used stock bov from a guy on here. Got the brakes mostley hooked up. Just got to run the vacume line for the booster and bleed them. You said that its an S5 motor? Correct me if im wrong but, you shouldn't have eleminate the OMP, S5 motors have a safe mode they enter when the OMP stops working. Unless your going to use an Rtek, so if I missed that just disregard this. I did not know that. It would be the ecu that does the safemode though correct? I'm running an s4 ecu. Oh and does anyone know if i can use my s4 na bac on my s5 t2 motor? It fits but I don't know if it would work right. I hear getting it to idle is a pain in the *** without it. You will be running the S4 ecu, so you will not need the OMP if you premix. The S4 ecu doesn't go into limp mode if the OMP goes bad like the S5 ecu does. You can use the NA BAC, but you won't have an idle adjustment. 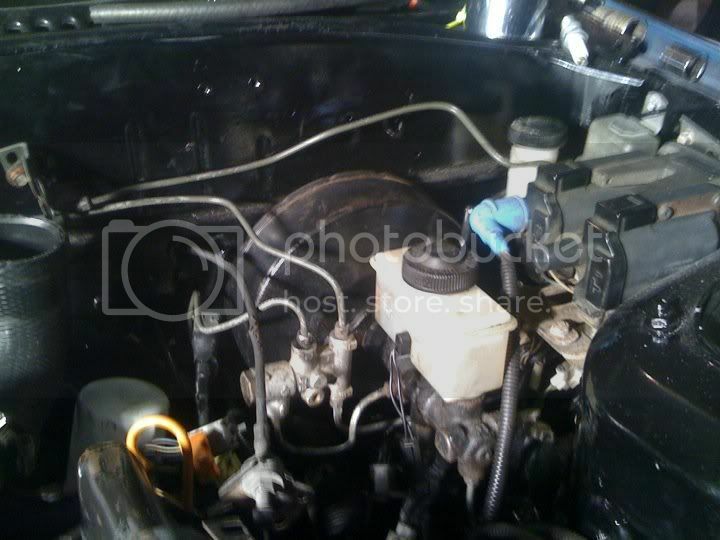 The TII BAC has a screw on it to adjust the idle speed. Oh good your using the S4 ecu, I just wanted to give you a heads up about that issue, build looks good keep it up! First, do I need a knock sensor? I have a spot for one in both rotor housings. The motor didn't come with one though and my n/a didn't have one so I wouldn't have anything to plug it into on the harness right? 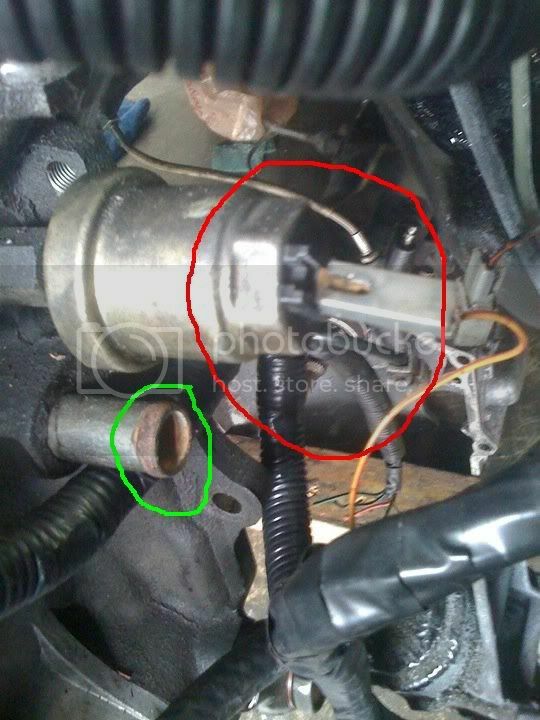 Is the thing circled in red the oil pressure sensor and does it look like it's plugged in the right place? And I think the thing under it is for coolant. it's capped on my other motor si I don't know what it's suppose to go to? Should I cap it? Now for the bov/ air bypass valve. According to my haynes book that's where it goes which makes sense. Now where does the other end go? I'm thinking where the red line goes on the intercooler pipe but it doesn't line up to great. Do I just run a big vacume line? The green vacume port circled is suppose to go to my bac according to my manual but I'm not running one for now so can it just go to any vacume port on the uim? And the port circled in blue, I have no idea where that goes. Last question is, since I'm not running a bac what do I do with the coolant lines that go to it. I know where the one in the front cover comes from but I don't know where it goes after it comes out the other side of the bac. Do I just run a line without the bac or do I cap them. I couldn't find any of this on 7club and team fc3s is down for maintenance.